Climate change and pollution have certainly changed things in Highgate and not always for the worse. Did you know that with less soot and more nitrogen in the air, we now have far more lichens and mosses on our trees and that the warmer winters mean that the mimosa will survive to grow far bigger than ever it did before? 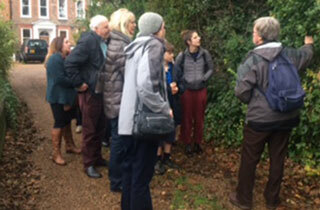 Just a few of the fascinating pieces of information we learned from Jeff Duckett on our Tree Walk around Highgate village on Saturday 24th November – our own small celebration of National Tree Week. We were given historical and social context by Michael Hammerson who showed how much the Holm Oak outside Highpoint had regenerated after the 1987 storm almost killed it and pointed out a coppiced hazel that may have been there for hundreds of years. In fact we became so absorbed by the trees we saw, that we had to cut the walk short, leaving the opportunity for another walk around the Hampstead Lane, Bishopswood area, for another time. If you are interested in the trees in the Highgate Neighbourhood Forum Area, please contact Louise Lewis on mathscounts@hotmail.com to join the Highgate Tree Group list.